It can be hard work to figure out what your big, bold brand message is. One thing that makes it even harder is that your message is constantly evolving. Just as you as a person keep changing and growing, so does what you want to share with the world. It’s normal to have periods were your brand message feels off-kilter or not quite “you.” It’s a sign that you & your business are growing, and that’s a great thing! 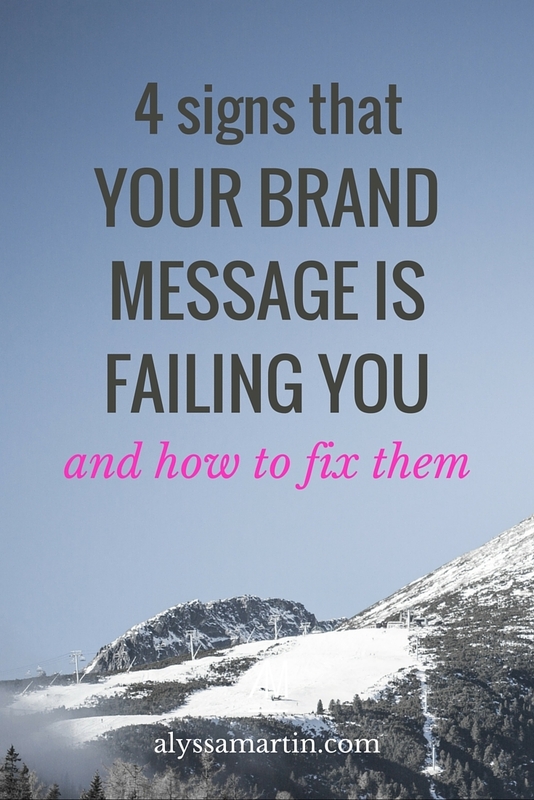 I want to share with you 4 signs that your brand message is not quite right & needs an update. But I’m not just going to give you the 4 signs that you need a brand message overhaul and leave you hanging. I’m also going to reveal the questions you need to ask yourself to get clear on what’s really missing from your messaging. Why am I giving you Qs, instead of giving you answers? Because a lot of introspection and self-awareness go into discovering your brand message. Often, I can’t tell you the answers, you’ve got to uncover them for yourself & these questions are designed to help you do just that. Do you have clients that don’t really understand the importance of what you do? Or they show up late to your meetings? Or they forget to answer the pre-session questions you send them? Or they don’t respect your professional advice & want you to do something even after you’ve advised that it’s bad for their business? It can be the difference between positioning yourself as a web designer vs a web strategist. A client may see a web designer as someone who follows instructions and designs what they’re told to design according to a strict list of requirements. But they may see a web strategist as someone who helps them make smart decisions about their website & broader web presence. Any one who wants a ‘yes woman’ or pixel pusher is probably going to be attracted to a general web designer, but they may be turned off by the web strategist who will give them honest feedback on their design requests & online marketing strategies. If that’s not the kind of client you want to attract, then it’s time to change up your brand message so that you repel the so-so clients and attract the dreamy ones. The same goes for coaches and healers too. No matter what industry you’re in, your brand messaging will attract a certain type of client. It’s important that it’s attracting clients that you genuinely enjoy working with, otherwise you’ll start resenting your clients & your business (and that’s not good for anyone). Ask yourself what you don’t like about the clients you’re currently attracting? Are they too lax with their deadlines? Do they give vague instructions? Do they not understand the importance of your work? Do they not respect your advice? Now that you’re clear on what you don’t like, you can use your brand messaging to attract the opposite. For example, if you don’t want to work with someone who’s only in business for the money, then you can say that you only work with people who deeply care about their clients. That kind of brand messaging will automatically weed out the money-hungry folks who don’t resonate with that. Everything about your brand should align with your customer experience; your brand messaging, web copy, social media updates, email newsletter, everything. It should all be giving the same, clear message about what your customers can expect when they sign on to work with you. There should be no surprises. Your brand message should set a clear expectation of what it’s like to work with you. And, importantly, it should feel easy & natural for you to live up to that expectation. You want the experience of working with you to confirm every positive thing they expected would happen when they worked with you. Imagine you’re a really conservative person & you don’t like swearing. You think it’s unprofessional to go to a client meeting without makeup on & you always wear your best heels & perfectly coiffured hair wherever you go. You hire a business coach who seems to match your values & fits your very high standards of professionalism that reflect everything you learned in the corporate world. That is, until your first meeting. You meet over Skype and your new business coach has no make up on, she’s wearing an old, stretched sweater & has ratting, unwashed hair. She drops The F Bomb in the first 5 minutes of your meeting. It wouldn’t matter how smart or insightful your new business coach’s advice is because you’d be so shocked by her behaviour, appearance & language that you wouldn’t be able to absorb anything she has to say. You’d immediately start to question your decision to hire her. You might even feel like you’ve been deceived because you didn’t discover these things about her until after you handed over your money. This can happen when your brand messaging doesn’t reflect who you really are & what it’s really like to work with you. What surprises your clients when they work with you? Where can you update your brand messaging & web copy to clearly describe what it’s really like to work with you? Once you know where the confusion lies, you can begin to update your brand messaging to reflect who you really are & what you clients should expect to work with you. If you want inspiration, Morgan from A Little Creative does an excellent job of clearly expressing herself on her website & doesn’t apologise for being her sweary self. You don’t necessarily have to swear like Morgan does, but you do have to make sure your messaging aligns with your real personality & style. A high unsubscribe rate doesn’t necessarily mean your newsletter is crap. It’s most likely a sign that what they expected from your newsletter (based on what they read on your website) & what they found in reality were 2 different things. Let’s say that you landed on my website (like you have today) and you sign up for my free 8-day email course, Copywriting That Hooks More Clients. Then imagine that you start getting a weekly email from me. Only, it’s not a copywriting tip for attracting more high quality clients… it’s an inspirational message to help you keep your spirits up during this entrepreneurial emotional rollercoaster. Is that what you signed up for? No. Have I broken my promise to you? Yes. Are you going to get bored & unsubscribe? Probably. I promised that I’d send you copywriting tip & I broke that promise. That would make my unsubscribe rate go through the roof. All because my messaging didn’t aligned with the reality of what I was offering (even if that offering was just a free email every week). They love it when you say you’re going to do something & you actually do it. It’s a very, very important part of building the know, like & trust factor. If you’ve got a high unsubscribe rate, look at what you’ve written on your landing page or any social media update that leads people onto your list. Does that messaging accurately reflect what goes out in your email newsletter? If not, fix it. Explain exactly what they’ll get when they give you their email address & make sure you deliver on that promise. Feeling aligned with what you do, who your serve & what you have to say to the world is an important motivator when you work for yourself. If you don’t feel aligned with your own brand message, then you’re not going to want to share it with anyone. You won’t want to tell anyone what you do. You’ll shy away from marketing your business as much as you should. And all that means less clients and less cash moving through your digital doors. Any time that my income has taken a dive, it’s been because I had outgrown my message & wasn’t excited about marketing myself anymore. I didn’t want anyone to find me online because the face I was putting forward didn’t feel very “me.” For me, an income dip is an excellent indicator that my messaging needs updating. And a lot of my clients feel the same. Ask yourself what doesn’t feel right about your messaging anymore? What do you really want the world to know about you & your work that isn’t expressed in your current brand message? What’s holding you back from sharing that message on your website, loud & proud? Once you know the answers to those questions, you can begin updating your message so that it feels 100% you again. The difference is that now you’ll know what you really want to say.